Easy 30 minute recipes for weekday cooking - Blog - Abbondanza! In the fashion world, the philosophy of “less is more” often applies, but in the food world, “more is better” wins the day. Chefs like to impress with flavor, spice and big presentations. That’s why expressions like, “Bam!” and “Kick it up a notch!” are so popular. Wolfgang used to say, “Abbondanza!” to me when I was creating a new plate for the dining room. Abbondanza means “abundance” in Italian, but to Wolfgang Puck it means more meat, more veggies, more color, more flavor, more height, more everything! The more, the merrier. Beef brisket fits the abbondanza bill. At home, abbondanza means enough food for tonight’s dinner, tomorrow’s lunch and a few snacks in between. So if you have a choice between a 4 and a 5-pound brisket, pick the heavier one. The recipe may call for “4” tomatoes, but add as many as you have on hand. And if you need more broth, then pour it in the pan, too. These are all economical ingredients, so don’t be shy. Brisket is easy to prepare and it doesn’t cost much either. It cooks for hours in the oven, which gives you time to prepare the rest of the dinner, set the table, and otherwise go about your Sunday afternoon of catching up on chores and playtime. Preheat the oven to 425°F. Rub both sides of the beef brisket with olive oil, salt and pepper. Heat your largest roasting pan until it’s very hot. Sear the seasoned brisket (fat side down first) on both sides until it’s golden brown. 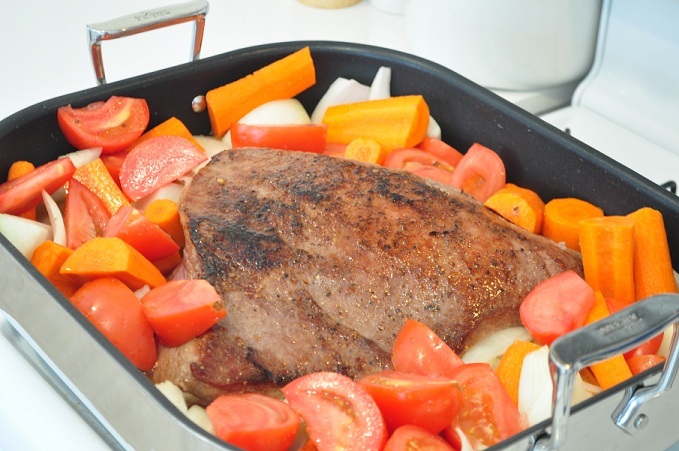 Add the onions, carrots and tomatoes with the brisket. Sauté for 8 to 10, minutes or until they’re soft and aromatic. Add the chicken broth, bring to a boil, cover with foil and place in the oven for 30 minutes. Turn the temperature down to 300°F and cook for 4 hours. Remove the roasting pan from the oven, carefully take off the foil and transfer the brisket to a cutting board. Allow the brisket to rest for 10 minutes and trim off any fat on the top. Slice the brisket against the grain and serve with a generous helping of the vegetables and broth. 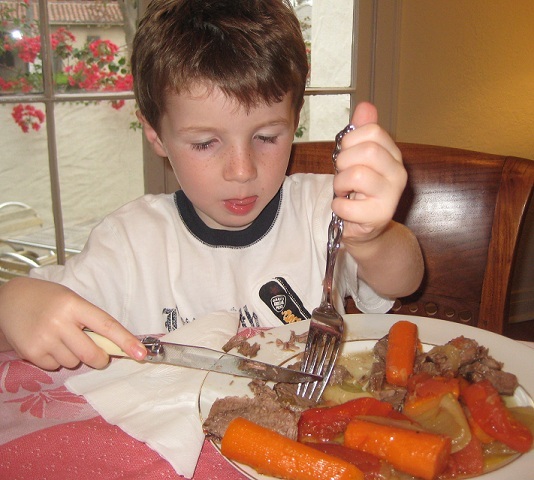 T he boys love the flavorful broth that has steeped with carrots, onions and tomatoes. It’s almost like beef and vegetable soup that you eat with a knife and fork. They haven’t learned yet not to like cooked carrots, and instead, love the sweet and tender roots, especially when glazed with roasted meat broth. Abbondanza! Nowhere in your rambling, incoherent article was there any sign of intelligence. I provide you with no points and could possibly God have mercy on your soul. Ohhh I love the beef brisket recipe. It sounds really yummy and homey. I can't wait to make this for my family. Thanks for sharing!